Hyundai's rear-wheel-drive Genesis features modern styling, powerful V6 and V8 engines with up to 375hp, fine ride and handling, and extensive standard equipment for a bargain price. 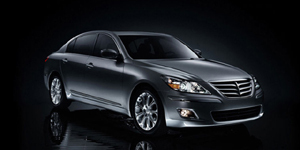 The all-new Genesis marks Hyundai's entry into the luxury vehicle market. Based on an all-new rear-wheel-drive platform, the Genesis features two performance engines, fine handling, and a well appointed interior with standard leather seat-upholstery, dual-zone automatic air-con, cruise control, front and rear side impact airbags, and power front seats.